"Kyle Lee Scores Late Model First in Winchester Season Opener"
"Corbin, Roberson Fast in E-Mod, RUSH Crate Features"
Winchester, VA- Kyle Lee scored a hard fought win in last Saturday nights season opening 30-lap Late Model feature at Winchester Speedway. The win for Lee, steering his Rocket no.2T, was his first career win with the Late Models although he'd won at the track with the Limited Late Models and RUSH Crate Late Models. Lee and Dale Hollidge made up the front row for the start of the event with Lee out-dragging Hollidge into the first turn to take command. Lee would eventually lead all 30-circuits in the caution free event that was spun off in 8 minutes and 48 seconds. "We made the decision late this afternoon to come here, and I'm glad we did." Lee stated from victory lane. "I'd lake to thank all our sponsors, my Uncle Dougie and my mom and dad because this wouldn't be possible without them." Heavy lapped traffic was the only scare Lee faced during his winning drive. "It was a little tricky getting through tonight." Said Lee. "The track was in great shape which made it easier with the lapped cars and it all worked in our favor tonight." Dale Hollidge, Trever Feathers, Jonathan DeHaven and Brad Omps completed the top-five. Heats went to Feathers and Hollidge. After a win Friday at Potomac, Logan Robesron made it a weekend sweep as he was triumphant in the 20-lap RUSH Crate Late Model main. Roberson darted from the pole and would eventually lead the distance, but would have to fend off a furious late race charge from Trever Feathers to score the win aboard his Rocket no.17R. "The lapped cars were crazy here tonight." Roberson stated post race. "I knew Trever was getting close there at the end and we did what we had to do to hold him off." Devin Brannon, Al Shawver Jr. and Jon Painter rounded out the top-five. Heats went Roberson, Feathers and Eric Wilson. Mike Corbin drove to his first career Winchester E-Mod feature win in the 20-lap Mid Atlantic Modified contest. Corbin took the lead from Brad Kling on the 4th lap and would hold off a pesky Chris Arnold in the closing laps to take the break-through win aboard his ARC Race Cars no.25. "We changed just about everything on this car over the winter and I think it paid off." Corbin remarked. "Greg had this place in great shape tonight and it feels awesome to finally get a win with the E-Mod's here." Brad Kling, defending track champion Ray Kable Jr. and Allen Brannon completed the top-five. Heats went to Alyssa Rowe, Brad Kling and Ray Kable Jr. 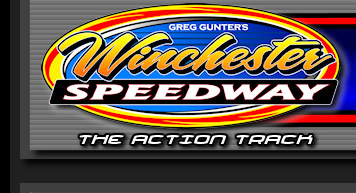 In support class action, former track champion Chris Sumption drove to the win in the 15-lap Pure Stock feature, Allen Griffith took his first career Winchester feature win in the 15-lap U-Car main with Austin Nichols scoring a thrilling win in the nightcap 15-lap Enduro Stock feature.